Location: Musee d'Orsay, Courtauld Gallery, Barnes Foundation, Metropolitan. 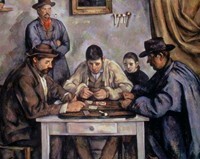 The Card Players is a series of Impressionist paintings by the French modernist Paul Cezanne. One of his most ambitious projects, now seen as an important contribution to modern art, it occupied him for several years. Please note that the term 'Impressionist' is used here in a general sense, to describe a loose, almost unfinished style of painting, rather than Monet's spontaneous type of plein-air art. For more, see: Characteristics of Impressionism (1870-1930). Although painted during Cezanne's final period, they represent some of the greatest genre paintings of the French School. There are five versions in the series, each varying in content and size: one is in a private collection, the others are in the Musee d'Orsay, the Courtauld Gallery, the Barnes Foundation, and the Metropolitan Museum of Art. The privately held version was bought in 2011 by the Royal Family of Qatar for a sum estimated to be between $250 million and $300 million. Cezanne also executed a number of preparatory oils and drawings for the series, including: Study for The Card Players 189092, Rhode Island School of Design Museum); Man with a Pipe (study for The Card Players) (1890-2, Nelson-Atkins Museum of Art, Kansas City); Study for The Card Players 1890-2, Worcester Art Museum, MA); and Man in a Blue Smock (1891-97, Kimbell Art Museum, Fort Worth, Texas). Cezanne is famous for his still life painting, and art historians believe that he chose the subject of cards because the people playing the game were essentially a form of human still life. He was also probably influenced by the Nain Brothers (1599-1677) whose Card Players (c.1642) was in the collection of his local art museum in Aix-en-Provence. 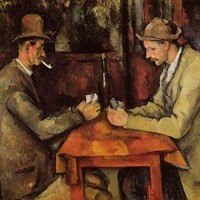 Each painting in Cezanne's series shows two or more Provencal peasants quietly smoking their pipes and playing cards. 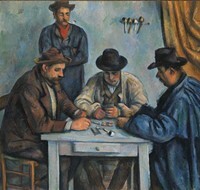 They were mostly modelled on workers from the Cezanne family estate known as Le Jas de Bouffan, many of whom came to sit for him over the years, including an old gardener known as 'le pere Alexandre' and a farm worker by the name of Paulin Paulet - both of whom appear in the two card-player versions of the subject. At any rate, unlike the drunken, rowdy peasants memorialized in the seventeenth century paintings of the Dutch Realist School of genre painting (1600-1700), Cezanne's peasants are all studiously intent on the card game in front of them, and make no attempt at conversation. There is no excitement or melodrama. On the contrary, Cezanne's figure painting conveys a sense of timless tranquility throughout the series. In his book "Cezanne. A Study of His Development" (1927), the art critic Roger Fry (1866-1934), a leading authority on Post-Impressionism, described Cezanne's card players as having such an extraordinary sense of monumental gravity that they have found their true centre and can never be moved. For some of Cezanne's best paintings, see The House of the Hanged Man (1873); The Bridge at Maincy (1879); The Boy in the Red Vest (1889-90); Mont Sainte-Victoire paintings (1882-1906); Woman with a Coffee Pot (1895); Large Bathers (1894-1905); Lady in Blue (1900); and Young Italian Woman Leaning on her Elbow (1900, J. Paul Getty Museum, LA). We know how irritable and shy Cezanne was. He only liked to paint human beings when the sitters were, apart from himself, his wife, who was patient and resigned and posed for him twenty seven times, a few intimate friends, servants, gardeners, peasants, youths, all humble and respectable people who sat for hours without uttering a word. The sittings were long, so the pose had to be simple. This accounts for all the models who are sitting, hands crossed on their knees, or elbows leaning on a table. The Card Players is no exception. The sitters are the ordinary locals. The player on the left is doubtless 'Pere' Alexandre, a gardener; the other figure is Paulin Paulet. (For individual pictures of both men, see: Man Smoking a Pipe (The Smoker) 1890-2). This version, the best known and most often reproduced, is the smallest in the series, and has been described, somewhat controversially, as the most monumental and refined of the five. The monumentality of the works epitomises Cezanne's stated aim to produce "something solid and durable, like the art of the museums". In terms of content this is very similar to the Musee d'Orsay version. In this picture - as in each of the two-player canvases - a wine bottle standing in the central area of the table, acts as a dividing line between the two participants. Less than half the size of the Barnes painting, this work contains one less figure (no boy), but otherwise the composition is virtually the same, except for the removal of a few details from the back wall. The picture is brighter, and more of the table surface is visible which makes the composition less cluttered and the players more noticeable. Of all the versions, we like this one the best. Pared down to its essentials, like the Courtauld and Musee d'Orsay versions, it has a monumentality all of its own. This version, the largest and most crowded, features five figures. Three card players sit in a semi-circle around a card table, with two spectators behind - one is a boy, sitting with eyes cast down; the other is a man standing, smoking a pipe. NOTE: For the full story behind Impressionism in France, and the group of painters who started it, see our 10-part series, beginning with: Impressionism: Origins, Influences.  The Ballet Class (1871-4) Musee d'Orsay. By Edgar Degas.  Dance at Le Moulin de la Galette (1876) Musee d'Orsay. By Renoir.  Absinthe (1876) Musee d'Orsay. By Edgar Degas.  Luncheon Of the Boating Party (1880-1) Phillips Collection. By Renoir.  El Jaleo (1882) Isabella Stewart Gardner Museum. By John Singer Sargent.  For an explanation of other Impressionist compositions, see: Homepage.